"Grid check: not quite a check, but a nice grid. It looks splendid both with a bright tie or with two buttons undone – a handy styling ease for after-work socialising." "Made from 100% cotton mid-weight twill – completely non-iron." The shirts I ordered were slim fit, and I must say they were still very loose fitting. I have ordered from others, such as Twillory and TM Lewin, and find their slim fits are better fitted. CT's non-iron fabric is very good and soft, but the fit was very disappointing. Response from Charles Tyrwhitt: With our wide range of fits and sizes, we truly believe we offer the perfect fit for everyone! The Slim Fit is very much a "regular" fitting shirt, however, and isn't designed to be too slim - the name notwithstanding. I would definitely recommend giving the Extra Slim Fit a try, as I feel it will be a much better fit for you. Just raise a very simple online return with us at www.ctshirts.com/rebound and we'll get them out to you. Response from Charles Tyrwhitt: I am very disappointed to hear that your new shirt was received faulty. This truly is unacceptable and please accept my apologies. 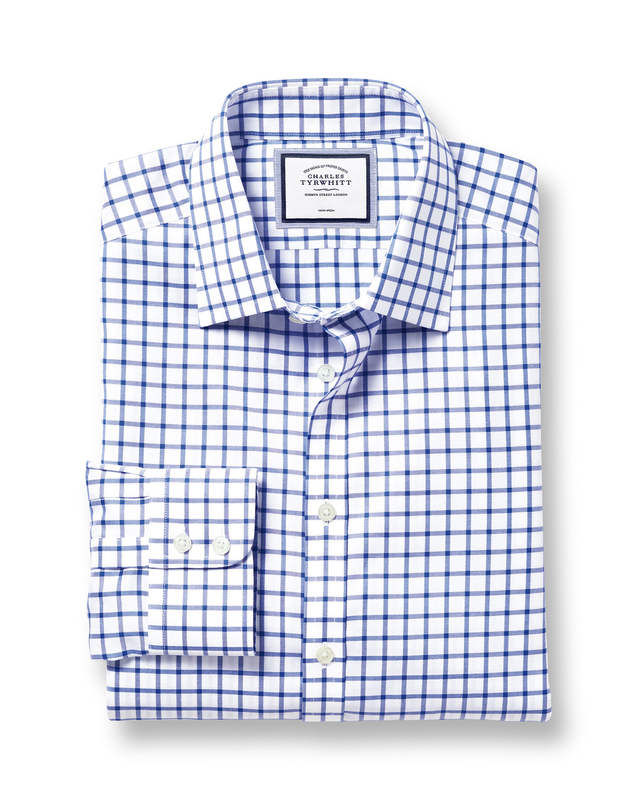 I have organised for a brand new Slim fit non-iron royal blue grid check twill shirt to be sent to you and have forwarded you a separate email with instructions on how to return the faulty shirt to us, free of charge of course. I do hope the new shirt arrives in perfect condition and is fault free. I love the shirt; just what I wanted and fits well.